I was woken up by the long melodious call of a blue whistling thrush at sunrise. 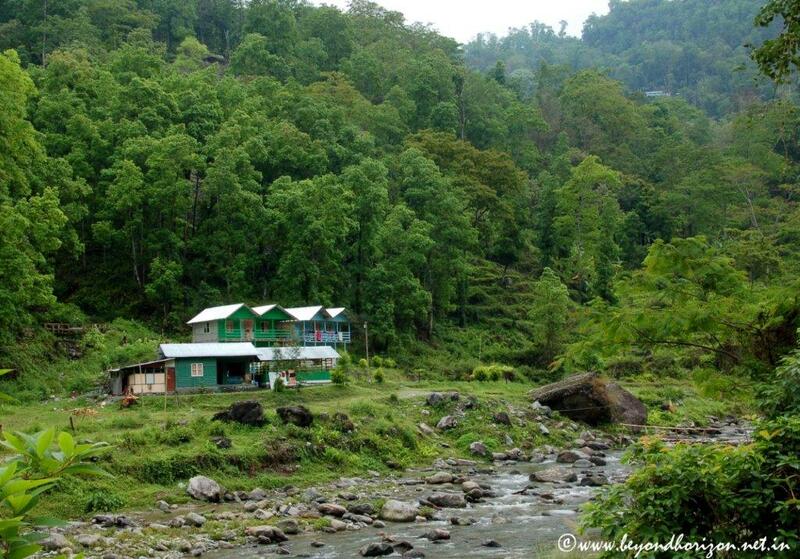 I am staying at a camp by the Reshi river in the eastern Himalayas. Lying on the bed, I could hear the sound of rain incessantly falling on the roof, mixed with calls of so many birds I do not know the names of. The gurgle of the river, as the rapids pass through the rocks, is omnipresent here. It soothes my soul. I picked up my camera, as if by habit, and walked out of the room to find a dry place under a canopy, sort of a deck by the river. It is desolate here. Nobody in the camp has come out yet. The hills are thickly covered by trees, drenched in rain. I can see so many shades of green, uninterrupted. The hills beyond the ones just in front of me are still covered in fog – I can see only the outlines against the grey sky. It had probably been raining through the night. That has brought to life some small streams, coming down enthusiastically to meet the big river. The river is slightly swollen since last afternoon. A kingfisher is sitting intently on a tree by the river, keeping a close watch on the water. Sometimes, it flies down to the small bamboo bridge close to where I am sitting. Then it swoops down to the water trying to catch a fish and flies back to its perch. The bridge makes the river very accessible and friendly. I will cross it later to explore the other side. The call of a rooster, from somewhere behind in the camp, interrupts my thoughts. Smell of wood fire was wafting from the kitchen, a while back. Looking inside, I call out the kitchen help. He was probably not expecting anyone so early. After some small talk, he offered me a cup of black tea. I felt thankful. I walk back to the lonely deck, sitting down with the tea, smelling the flavour, still looking at the river and the hills beyond. It is still raining. 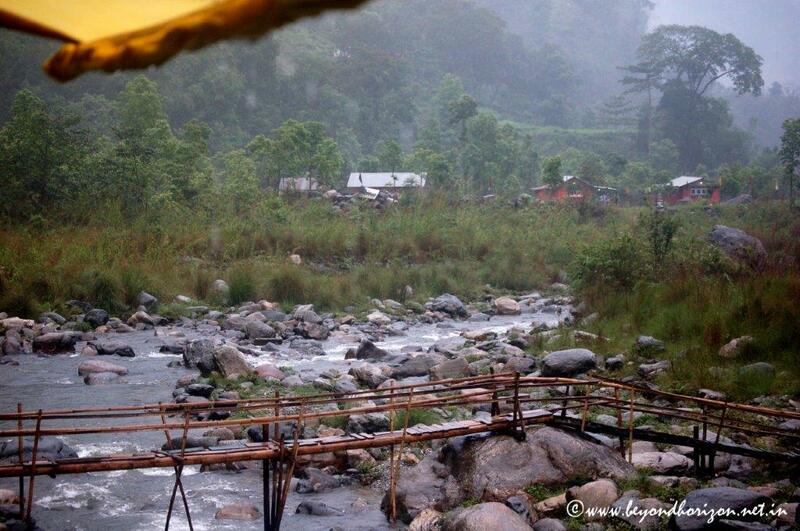 Water is pouring from the edge of the tarpaulin to the river below. I notice how powerfully the river surges over the smaller rocks, eroding them as it flows over. And how agile it is when confronted by a big rock that it cannot overcome, finding a quick way around it. There is a mild chill in the air and a slight wind is blowing. The smell of the forest envelops me. The fog has cleared a bit and the hills a little further away are visible now. There are a few small houses by the river, after the bamboo bridge. The birds are still flitting around busily, occasionally calling their mates. I take some photos. I am enjoying this perfect laziness – sitting here without any intent, not keeping time, watching the swirls of the water accompanied by the unending gurgling of the river, as it flows on – lost in myriad thoughts.